Whisk the lemon juice, hot sauce, salt, and pepper together in a shallow bowl. Dip each catfish fillet in the lemon juice mixture. Dredge catfish in seasoned flour, followed by buttermilk, and then corn tortilla flakes to coat completely.Pour oil into a large, deep saute pan until it comes about halfway up the sides of the pan. Heat oil to 350 degrees F. When oil is hot, carefully add fish fillets to pan, in batches if necessary, and deep-fry until golden brown, about 10 minutes total. 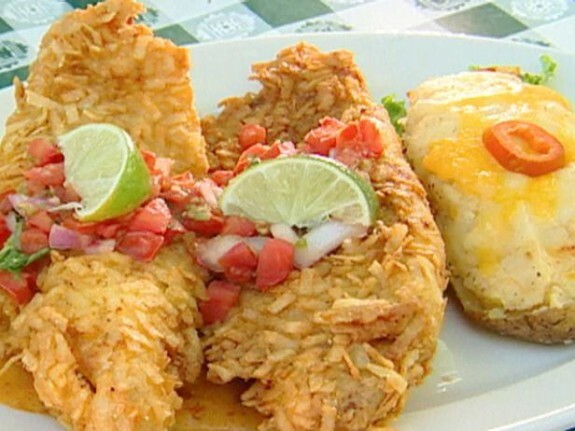 Remove from the oil and drain on paper towels.Place 1 1/2 ounces of queso on each of 6 plates and top with the fried catfish. Place 1/2-ounce of pico de gallo on top of the catfish. Garnish with a lime wedge and serve.